The chicken has landed, yes, pun intended. Haha! 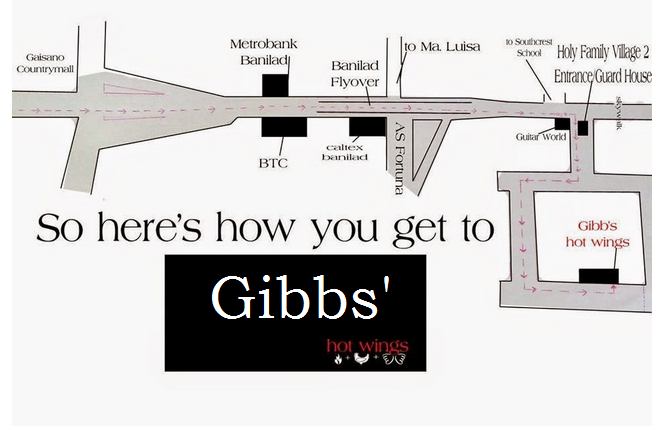 I got invited for the second time to visit Gibbs' after my no show, thanks JM of My Tasteful Life! It was a very calm night and breaking the silence was my tummy grumbling for food. I am flat out a chicken aficionado hence I am over the roof with excitement. I didn't know what to expect for 1. I have not yet read the reviews from the interwebs and 2. I wasn't really a fan of spicy food. But don't get me wrong, I love anything with a kick. I was a tad worried that this might kick me so hard that I may not be able to recover. I noticed that most newly opened places are within residential areas. This is not an exception, this is located in Holy Family Village 2. It was a short walk and boy was I ready. We were welcomed by Frank Oliva, the owner of HeartTea. The place could sit 20 at most and was fully ventilated. A huge wall with guests' reviews filled the spaces. This used to be Frank's batcave. He would invite his friends over drinks and poker. This is mainly the reason why this place came to be. Interiors were bro-inspired. No fuzz just plain functional. While we waited for our dishes to arrive, I checked out the reviews on the wall and this one caught my attention. Kids, please do not skip school for food. Yes, Joshua I am talking to you! Haha! The place was named after the owners pet and from the TV Series NCIS which was the family's favorite. Frank serves as the wingman while the wifey is the main act. She cooks all the food selection fresh daily. Serving first is the newest addition to their growing list of chicken based selection: Chicken Pockets. Made with chicken strips, cabbage, cucumbers, red onions and tomato drizzled with their secret tangy sauce and sprinkled with abundance of cheese. Perfectly balanced and is good enough as salad if you are counting your carbohydrates. How to eat? Fill the half pita with the chicken salad and add dressing as desired. The pita bread could use some toasting but maybe it's just me. I am a person of texture so the salad truly delivered. Crunchy, crispy chicken and the cacophony of sweet and tangy dressing with the saltiness of the cheese is just perfect. Now, the moment of truth - Buffalo Wings is here. A plate full of hotness, 10 piece chicken wings slathered with spicy sauce and neutralized by their special dressing. I loved that there options for the non-spicy crowd. Sweet, spicy and trust me you would need more. I sure wanted rice right then and there. Haha! Serves 2 or 1 if you are like me, selfish. Costs Php175 which is quite affordable. And of course, any visit is not complete without the wall of reviews. I had to think of a clever way to incorporate the feels without being too cliche. FTW! blog approved! Haha! Lagi uy! Lami kaayo!